The population of religious minority (Muslim) is 8% of the state population as per census, 2001. 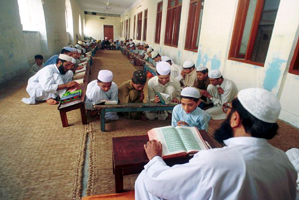 Presently, there are 127 Madrassas in the state, where secular education has been introduced. In order to provide require infrastructure and other teaching & learning inputs, necessary measures would be taken up during 2009-10. Tripura is a state where there are 180 Madrassa. More than, 12,964 students are studying. Recently, State Govt. has given an out standing and massive drive to take up infrastructure development in Madrassa. Mainly, the following items have been taken in to consideration. There are 156 teachers in 51 Grant-in-aid Madrassas and 387 teachers in 129 SPQEM Madrassas 6034 boys students & 5667 girls students respectively. 100 seated Boys Hostel at Baspukur Senior Madrassa, at Sonamura. Dauddharani Fazil (HS) Madrassa 100 seated Boys Hostel at Sonamura. Kurti Fazil (HS) Madrassa 50 seated Boys Hostel at Dharmanagar. Tilla Bazar Fazil (HS) Madrassa 100 seated Boys Hostel at Kailashahar.